When I was a girl, my grandmother taught me to knit. Foolishly, I didn’t practice, and forgot. When I first lived some weeks in England, three sisters, elders in my sweetheart’s family, were my teachers. 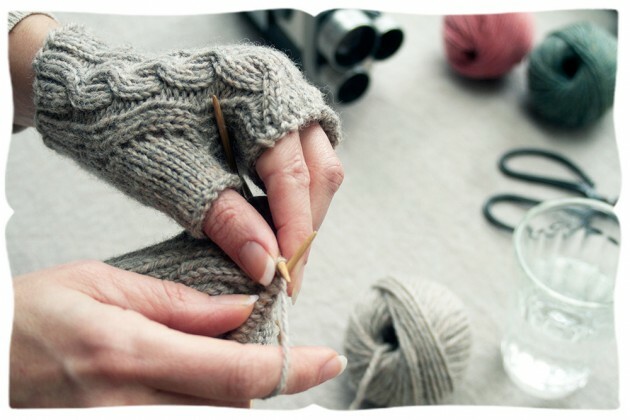 They cannot remember ever not knowing how to knit, and grew up at a time when, if your hands were empty, your mother handed you some work. I’m quite envious of learning so young, seeing as I waited til adulthood to take up the habit. My children have started early! You may think I knit very peculiarly, if you’ve not seen English knitting. I’m quite fond of it, particularly the speed and economy of movement – but ignore how I knit, and pay attention to how I cast-on. For a long time I used one particular method for casting-on (creating the stitches to begin to knit a piece), and then I encountered the stretchy method, and never looked back. 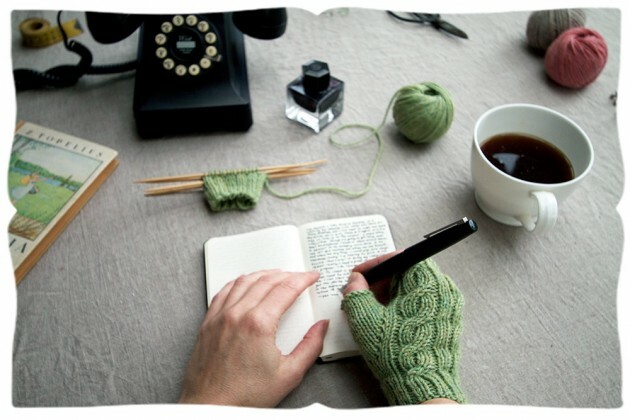 This, the third part of the “Cabled Handwarmers” set of old school movies in The Knitting Series, shows exactly that. It’s animated, even (it’s 4 minutes, and has a sweet little melody too). 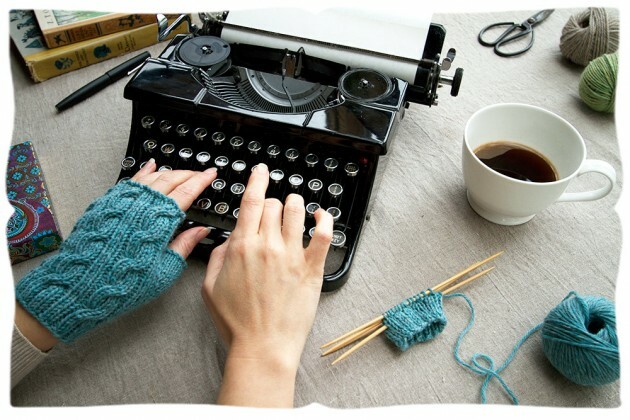 Learn it well, for just about any project, especially to knit the cabled handwarmers and mittens in this series. What do you think? Work along with the other movies in the “Cabled Handwarmers” set, at the old schoolhouse (in the lefthand column). 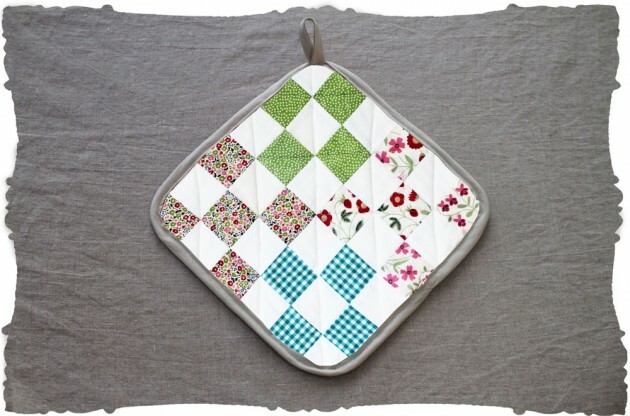 It’s very quick to buy the pattern to make these at the shop, just download and print! Very useful last-minute gift for a friend who wants to knit-in-the-round. Happy casting-on! Such a meditative process. Particularly if you find yourself falling in love with spinning your own! I prefer to pull yarn from the center of a skein, so that it needn’t roll around to unravel. Then I can knit or crochet freely, with the yarn in a handbag, which makes it easy to pick up my knitting at violin lessons, at the park, on the bus, at a café. 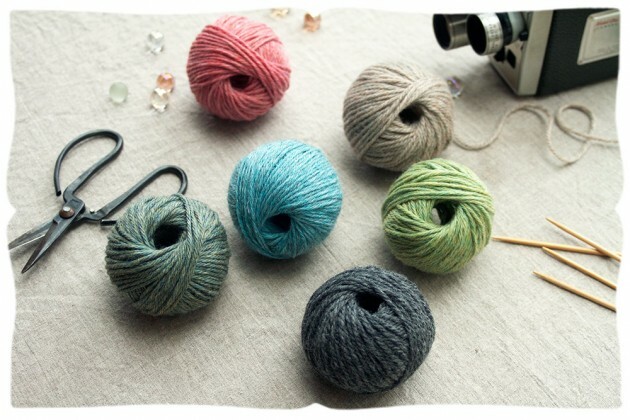 I’ll also wind yarn like this when a store-bought ball gets knotted up, or is half gone and getting a bit messy. Yarn is happiest loose ’til you’re ready to use it, without tension to stretch it, I’ve been told, and is also easier to send through the post. (Like the appleturnovershop does, naturally.) You might like to watch the other movies in the “Cabled Handwarmers” set, over at the old schoolhouse (in the column to your left). With great joy, I present the first homemade picture in The Knitting Series. (Did you catch the one-minute preview?) 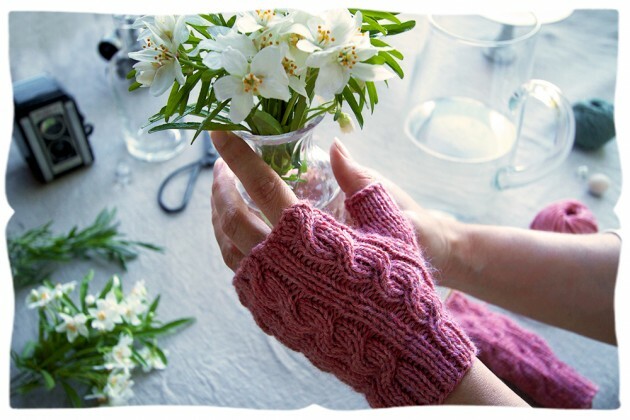 “Cabled Handwarmers” is divided into a set of nine tutorials to take you through the project, step-by-step. You can watch each part, on the left in the sidebar. We made it just for traditional studies, to help you to work along with the movies to make the knitting projects and the quilting projects. 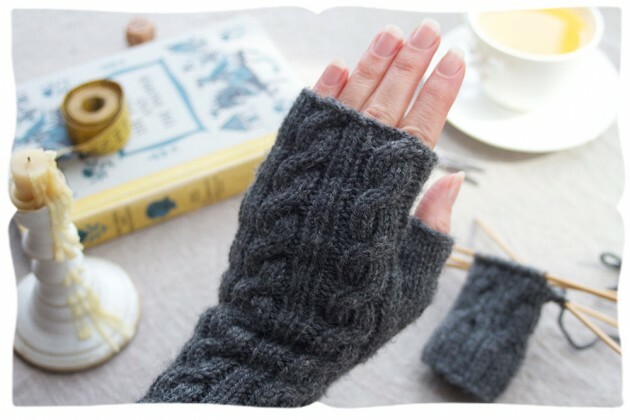 I want to show you the first of the nine parts, the introduction to the “Cabled Handwarmers” project, gathering up and laying out all the materials you’ll assemble for the project. (It’s just 1.5 minutes.) My sweetheart and I had some fun animating the text to follow me. A little loveletter to Stranger than Fiction. I wish lists like this would follow me around in real life, my head is usually full of them. You might recognise my re-upholstery project? One day I will finish it, complete with gimp-braid. I do hope you enjoy all of the movies. Get the pattern at the appleturnovershop. Things have been deceptively quiet on appleturnover lately. Behind the scenes my sweetheart and I have been working flat out, shooting four new homemade pictures for the old schoolhouse. We filmed the Knitting Series in my mother’s bright studio in Deep Cove, and like the Quilting Series, the camera looks over my shoulder as I work, to help you see, step-by-step, every method needed to cable-knit and honeycomb-stitch your own handwarmers and mittens. There were many props to prepare, and organise, diagrams, storyboards, patterns and notes to draw up. Then we began editing (though my sweetheart is in England just now, so we are using high technology to collaborate!) returning to the intertitles that we loved using in the Quilting Series. For these movies we’ve added the dimension of animation, so another aspect of my art practice has reappeared. Lovely. We’re not drawing so much as writing on the screen, to help illustrate the old techniques clearly. As ever my work is a strange mixture of traditions and technology. I’ve designed printable patterns to take you through each step. What do you think of the knitting preview? Watch all the tutorials, free, you’ll find them in the schoolhouse in the column to your left. All through my studies of traditional skills, the most unexpected pleasure has been connecting to a long history of people with the knowledge to make things themselves. A pleasure of the handmade is also the tremendous centeredness, rootedness that comes with self-reliance. I love that moment when you really see how something, maybe a kind of food, an object in your home, a thing you’ve encountered your whole life, is made, and find that you can make it yourself. Making a useful thing, the way you’d like it, with great quality of materials and imbued with your personality, gives an object provenance, a story, and connects it to you. Which things in our homes have those histories? The best ones. The first homemade pictures my sweetheart and I made are The Quilting Series. 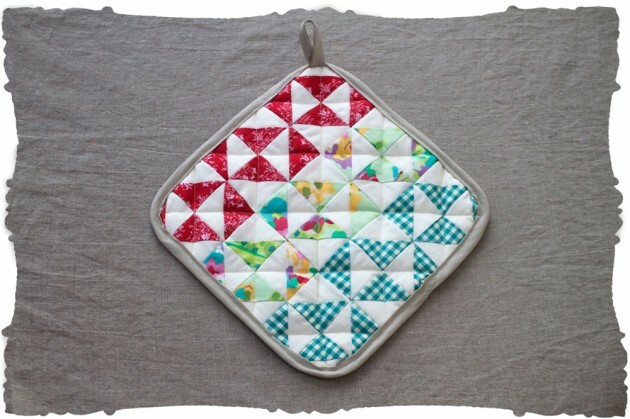 Quilting Squares and Quilting Triangles are guides to patchwork quilting, a small-scale project, one beginner, and one intermediate. They were shot in the studio at Knaves Acre, our old Sussex cottage. You’ve already met the starlet of this series, a beauty at one hundred years old. You can mail-order your own pattern from the appleturnovershop; then check back here to work along with the movies! Watch them in the schoolhouse, in the column to your left. 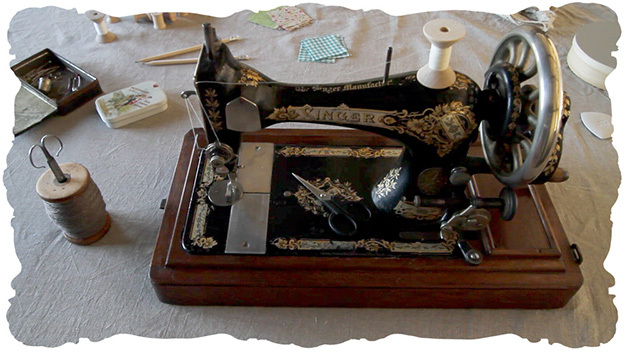 The culture that produced our extraordinarily strong, elegant, exquisitely engineered handcrank sewing machine must have envisioned a very different future than one of planned obsolescence. All its parts are built to last, and they have done, so exceptionally well that using it is like looking deep into history without the translation of a word or photograph. If I had the skills to build a machine, I would study this antique. Watching the bobbin winder alone is a delight. Working the crank is surprising, nothing catches, only smooth, magnificent turning movement. Absent of the electrical, the digital, it’s an object that I find at once enigmatic and much more accessible than any contemporary machine. Such a design! The children stitched their hand puppets on it with ease. It’s no surprise then, that this gorgeous little singer from the early 1900’s, with its curved wooden case and elegant paintwork, is the star of a couple of movies I’ve been making with my sweetheart. This is a sneak peek of the singer on set. Our little moving pictures will have homemade projects to go with them, I’m bundling the kits up now. Do sign up for the appleturnover quarterly to get an early invitation to the appleturnovershop opening, I’m aiming for later next week. Oh! If you’re in England and you’d like your own vintage sewing machine, my dear friend Sarah has a shop full of them. a tiny house, a root cellar.